Powszechna stereotypizacja osób starszych spowodowała eliminację tej grupy konsumenckiej we współczesnym marketingu. Obecni konsumenci–seniorzy są nowym pokoleniem odmiennym od zakorzenionych mitów. Dziś należą oni do grupy aktywnych konsumentów, szeroko zainteresowanych tym, co oferuje rynek. Nowo kształtująca się grupa wymaga od marketingowców po pierwsze, zauważenia tego rynku, po drugie zaś – dostosowania swoich działań marketingowych do tego segmentu, szczególnie w polityce produktowej, komunikacji marketingowej, tworzeniu i rozwoju marek oraz w marketingowym systemie. 1. Ahmad R., The older or ageing consumers in the UK: are they really that different?, „International Journal of Market Research” 2002, Vol. 44, No. 3. 2. Barak B., Gould S., Alternative age measures: a research agenda, „Advances in Consumer Research” 1985, Vol. 12. 3. Bernhart M., Penaloza L., Who are you calling old? Negotiating old age identity in the elderly consumption ensemble, „Journal of Consumer Research” 2013, Vol. 39. 4. Bondos I., Dlaczego seniorzy stanowią wyzwanie dla marketingu?, „Marketing i Rynek” 2013, nr 3. 5. Carrigan M., Szmigin I., Advertising in an ageing society, „Ageing and Society” 2000, Vol. 20, Iss. 2. 6. Ciura G., Gospodarstwa emerytów na tle innych typów gospodarstw domowych, „Studia BAS” 2012, nr 2 (30). 7. Diaz M.B., Advertising marketing industries to keep an eye on the new „old”, „Carribean Business” 2014, June 5, Vol. 38. 8. Kotler Ph., Keller K.L, Marketing, Rebis, Poznań 2012. 9. 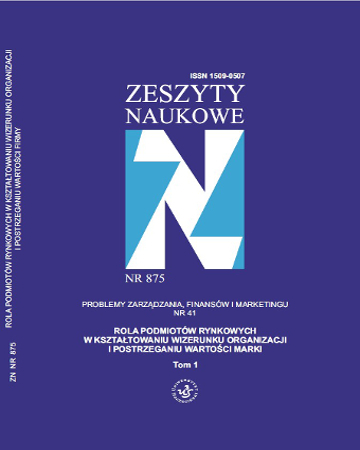 Kozielski R., Nadciąga „silver tsunami”, „Marketing w Praktyce” 2012, nr 8. 10. Lewis D., Older by age, younger by mindset: the attitudes and behaviours of the over 50s ad how to communicate with and market to this group, „Journal of Brand Strategy” 2012–2013, Vol. 1, No. 4. 11. Migdał-Najman K., Szreder M., Nowe trendy demograficzne a zmiany w konsumpcji w Polsce, „Marketing i Rynek” 2013, nr 11. 12. Omar M., Tjandra N.C., Ensor J., Retailing to the „grey pound”: understanding the food shopping habits and preferences of consumers over 50 in Scotland, „Journal of Retailing and Consumer Services” 2014, Vol. 21. 13. Schiffman L.G., Sherman E., Value orientations of new-age elderly: the coming of an ageless market, „Journal of Business Research” 1991, Vol. 22, No. 2. 14. Simcock P., Sudbury L., The invisible majority? Older models in UK television advertising, „International Journal of Advertising” 2006, Vol. 25, Iss. 1. 15. Sytuacja gospodarstw domowych w 2014 r. w świetle wyników badań budżetów gospodarstw domowych, GUS, Warszawa 2014. 16. Szmigin I., Carrigan M., The older consumer as innovator: does cognitive age old the key?, „Journal of Marketing Management” 2000, Vol. 16. 17. Tylee J., Is the industry ignoring old people?, www.campaignlive.co.uk/article/close-up-industry-ignoring-old-people/1016464?HAYILC=RELATED. 18. Worcester R.M., Help the aged, grey power: the changing face. Help the age, MORI/LSE, London 1999. 19. Żurawski T., Jak mówić – bo warto! – do 50+, „Marketing w Praktyce” 2015, nr 2.